Description	 MS in Latin on vellum, North Italy, 5th c., 1 partial f., 17x15 cm, originally 28x26 cm, 2 columns (originally 3 columns), (13x12 cm, originally 17x19 cm), 18 lines (of 23 lines) in an expert uncial without word spacing and abbreviations except Nomina Sacra, liturgical marginalia in a very small quarter-uncial with many ligatures, also of 5th c.
Binding	 Barking, Essex, 1988, red morocco gilt folding case by Aquarius. Context	 From the late Medieval binding of the Sacramentary, Reichenau, 9th c., Donaueschingen MS 191. Parts of 45 more ff. of the present MS survive, some only in offset: 2 ff. in Darmstadt, Landes- und Hochschulbibliothek, MSS 895 (offset) and 3140; 16 ff. in Fulda, Landesbibliothek, MSS Aa and 1a; 4 ff. in St. Paul in Carinthia; 20 ff. in Stuttgart, Landesbibliothek. Provenance	 1. Benedictine Abbey of Reichenau, Konstanz, Germany (ca. 830-late 13th c.); 2. Konstanz Cathedral, Germany (late 13th c.-ca. 1800); 3. Joseph, Freiherr von Lassberg (1770-1855); 4. Prince Karl Egon III, Donaueschingen (1820-1892); 5. Fürstliche Fürstenbergische Hofbibliothek, Donaueschingen, B I, 3 (1892-1982), present owner Prince Joachim Egon Fürstenberg; 7. Sotheby's 21.6.1982:1; 8. Winsor T. Savery, Houston, Texas (Pax ex Innovatione Foundation, Vaduz, Liechtenstein); 9. acquired via Sotheby's/Quaritch. 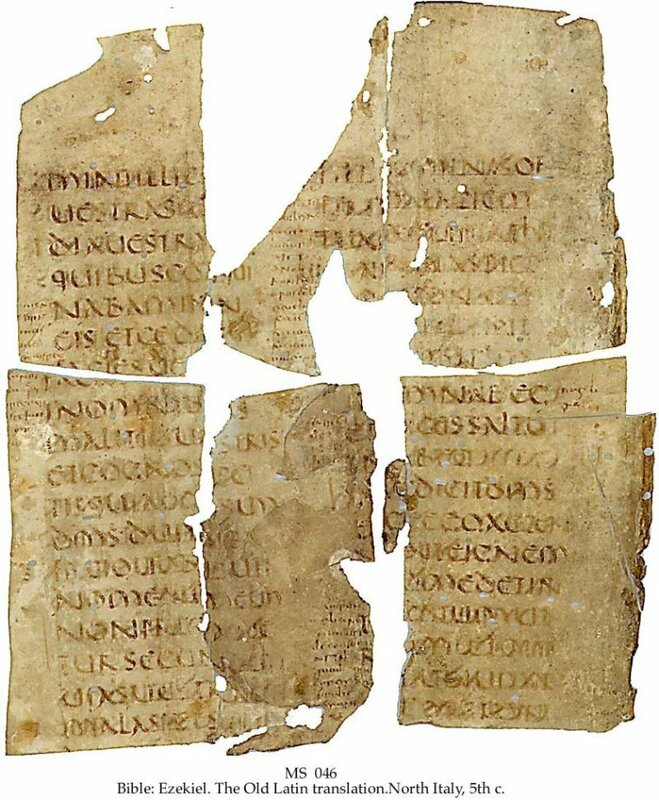 Commentary	 Oldest witness in Latin of Ezekiel 20, oldest European Latin leaf in private hands. 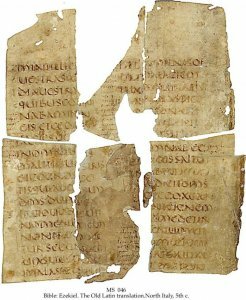 "Vetus Latina" is the old Latin translations of the Bible that preceded the Vulgate. No complete MS is preserved. Only scattered fragments have survived, and all except this MS are in public collections. E.A. Lowe: "An expert uncial of the finest and oldest type." CLA VIII:1174. Published	 Ernst Würthwein: The Text of the Old Testament. London 1979/80, pp. 88-89, 200-201. Mentioned in: E.A. Lowe: Codices Latini Antiquiores, vol. VIII. Oxford 1959, p. 43, no. 1174. See also	 See also MS 030, Bible: Matthew, Italy, 6th c.